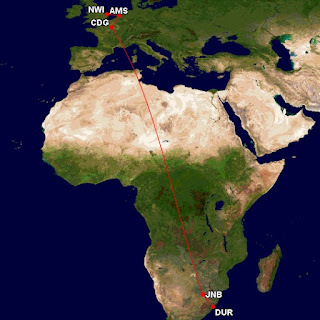 As I mentioned in a previous report, we picked this flight routing home mainly due to cost, but also the timings of the AF JNB-north flight meant that leaving the in-laws' house in Durban 3 hours before normal resulted in us arriving home over 6 hours before - see some previous reports on tha JNB-AMS-NWI route. After a lovely Christmas with the in-laws, including plenty of presents for the children, an a BBQed (braaied) turkey, it was soon time to return home to cold Europe. We picked the South African Airways flight as most airlines were similarly priced, but last year the SAA agent had checked in our luggage all the way to Norwich, despite being on separate tickets. We queued at checkin, and on arrival at the desk, the first problem occurred. Thanks to Amy being born after we'd booked the flight, I'd phoned up and added her to the reservation, or rather, she had a new ticket, linked to the reservation. Problem was, the agent could not find her ticket details. (The agent also said it was "impossible" to check through the baggage, as they use "different systems". Clearly not, as not 12 months before it worked, but perhaps it would involve a little extra work for her?) I was advised to go to the ticket sales desk whose system was apparently different, so they could find the PNR number. I made my way there, and joined the longish queue, and started searching through my emails on my phone to see if the confirmation email was still there. It was, so I returned to the agent, and she accepted it, tagged our bags to Johannesburg and gave us our boarding cards. Phew. We then went outside to Spur for a drink, and so Matthew could play on their climbing frame and trampoline. After a while, it was time to clear security and head airside. We'd left it quite late, so boarding was already underway. 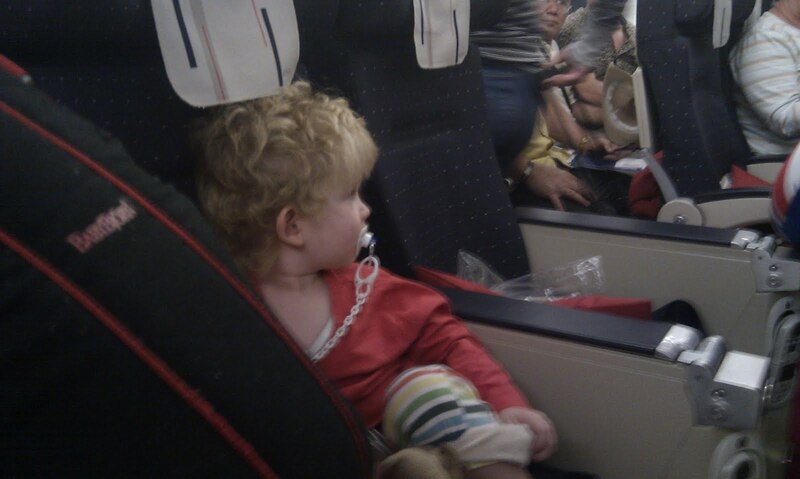 We left our pushchair at the aircraft door as instructed and found our seats near the back. As always, Matthew was fascinated with the safety card, and looking out of the window over Mummy's lap, where Amy was strapped. Boarding complete, a manual safety demonstration was performed, and the almost full flight taxied to the far northern end of the DUR runway and took off. We'd only been airborne for a few minutes when the turbulence started - aparently this is normal for the DUR-JNB route, thanks to the Drakensberg mountains pushing up the airflow from the coast. The bumps calmed down, and food was served. A ham roll for me with a small piece of cake, and Mummy and Matthew had the gluten free meal, a smoked salmon rice cracker sandwich. (Matthew has since had a gluten trial and has "grown out" of the intolerance). Neither of them liked the food, so I ate the fish part and they snacked on some crisps. The flight was quite short, and the new DUR location of the new DUR airport is slightly closer to JNB, further shortening the flight, so it wasn't long before we landed and taxiied in to the gate. We found our pushchair and collected our mountain of luggage, and went out to find Tam's Uncle Bruce, who came to meet us. Our first requirement was to check in for the next 3 flights. However on arrival at the AF checkin desk, there was a problem. We could all check in for JNB-CDG, and CDG-AMS, but only my wife and son could check in for AMS-NWI - not me nor my baby daughter. The agent spent a good 20 minutes trying to sort it out, but couldn't, explaining we'd have to try again in Paris. I wasn't looking forward to this, as we had 1h20, and had to transfer from 2E to 2F. We were also given passes for the "fast track security" at CDG. The big screen at the front showed the nose camera, and after a long taxi we took off towards the south. It has been said that the main difference from the passenger point of view of the A380 is the noise - indeed, it was so quiet. Also the overhead lockers seemed massive compared to the 747 and 777. Also, I could barely feel the movement, and the onscreen video of the takeoff seemed like we were barely moving at all, speed-wise. After takeoff, a meal was distriputed. Matty was still eating gluten free at that point (after testing, he has since been declared allergy-free by our pediatritian!) so his and Tam's meals arrived first - I held baby Amy. I unfortunately cannot remember what the meal was, or what my regular meal was either, other than to accompany it I asked for, and received, champage to drink :) After this the seat neighbours moved elsewhere, so I could join my wife and children together in the centre block of seats. I don't remember much more, other than I managed to sleep much more than I expected. Matty slept well too, only Amy woke for feeds at various points during the night. Breakfast was served, again I cannot remember what it was, sorry. Load was close to 100%, so I was surprised when the seatmates weren't replaced by someone else again. It was still dark when we approached CDG, and landed, and our first amount of fun began. After taxiing to stand, we all disembarked, and on exiting the aircraft, asked someone where we would pick up our pushchair. They didn't know, and a steward from the flight came and we asked him. He disappeared, and on returning said it would be on the carousel with our luggage. Needless to say we weren't happy with this, as we had a connection to another terminal, CDG has no trolleys for use with hand luggage, and the neighbouring A380's passengers, from JFK I think, had their pushchairs delivered at the gate. Well, we packed up, each adult carrying a rucksack, a holdall bag and a child, and we started out for 2F. We passed a transfer desk on the way, but they still couldn't check me and Amy in for the AMS-NWI flight! Great. Also I had put the boarding passes for the next flights that we did have in my pocket, next to a pack of baby wipes, which had leaked, making the boarding passes all wet (mouillé). Thankfully they were able to re-print them. Another 1km or so walking we came to 2F, where there was a massive queue for passport control, where a surly agent took his time in looking at our passports. Then there was security - thankfully we had the fast-track passes. Still the fast-track queue took some time. Finally we made it into 2F, found our gate, and were the last to board our flight to AMS. My wife mentioned that I must love this, rushing about airports - I replied that no, I like to take my time, relax and appreciate the airport environment. At least we had a row of 3 to ourselves, with Amy on my wife's lap and Matty in the middle. This flight ended up taking off about 30 mins late, due to weather in AMS, which shortened our transfer time even further... Eventually we took off after another long taxi. When the service came, drinks and a croissant, I mentioned to the FA (in French this time) that we have "une correspondance très courte", she took our boarding passes and disappeared. On returning she said she had spoken to the captain, and to ask again on arrival at AMS. By this time were were circling AMS, and landed shortly later. On disembarking at the gate, there was indeed someone there asking if we were the family with the short connection (by this time take-off was scheduled in 20 minutes!) We were indeed. So we were advised to follow her quickly. We grabbed a hand-luggage trolley (why doesn't CDG have these?!) and walked briskly after her - Amy in the sling, with Tam pushing the trolley, and Matty on my shoulders. The agent led us to the front of the queue for passport control to enter the non-schengen zone, and the border control agent glanced at our passports and waved us through. The KL agent who had led us this far waved us on, and we thanked her, before another agent who was waiting for us beyond the passport control desks called us over and led us to the D6 gates, the bus gate area where most of the KL UK regional flights depart from. At this point we still had not checked in myself and Amy for this flight, so whilst we were going through the security check at the gate entrance, the agent took our boarding passes we had, and passports, and proceeded to simply print and give us all new boarding passes. I've no idea why JNB and CDG had such an issue with this before! We then were taken to the bus, which left for the Fokker apron, where we boarded our F70. This flight was packed, much more so than the evening flight we normally take. There appeared to be some people in the seats we had been given, they too had been allocated the same seats, so we had to find another empty seat - only ones free were near the back, an A and C next to each other on the 2 side, with a D seat one row in front, which I took. I could try to entertain Matty with books and toys by reaching round behind me. Still, this was a quick flight, and the service was a packed orange juice and a biscuit, no choice, so Matt had his, and we came in to land easily. There was a slight spitting rain, usual for the UK ;) to welcome us home. We were last off the plane, and the passport control at NWI consists of 2 desks, of which only one was occupied. A full F70 load of passengers in front of us, it took a while. Then at the baggage carousel, nothing. Everyone else except one other guy had picked up their luggage and gone. We, and he, went to the enquiries desk, and were both told that our luggage hadn't made the connection in AMS (surprise surprise). It had made our CDG-AMS flight though. It would probably arrive either that afternoon, or the next morning, they would phone us to say. We then exited, and finding one single taxi at the rank outside, took it the 10 minutes home. Later on, we were phoned to say our luggage and the pushchair were at the airport. They would courier it to us the next day, or we could pick it up in person, so I went back to the airport to get it. On finding the agent who had phoned, she unlocked a cupboard, and there was our luggage, and pushchair! I noticed that one of the bags' handle had broken off, and a mudguard had come off the pushchair and was missing. The agent gave me a form with a link to an online claim form, and helped me get the stuff to the car and home. I filled out the form online, and a few weeks later, a courier delivered a new suitcase, and replacement mudguard. At first glance, this route is indeed quicker than having to wait 6h in AMS, but AF do sell some very short connections in CDG, this being one. Too short in my opinion - the rushing and stress were not worth it. Whilst I have a soft spot for AF as a former employee, I won't be taking this route and timing combination again. Some agents' attitudes were quite harsh, bureaucratic, not willing to help, but others did indeed go the extra mile - see the FA on the CDG-AMS flight who managed to contact KL on the ground to help us. CDG also needs hand luggage trolleys like AMS, and more moving walkways, to make transfers easier. KL were the stars of the show, even though they only operated our last flight (and officially we were on AF tickets). And even after the journey ended, they replaced our suitcase without quibble. They are definitely on our fly-again list!